Qibõ is our talking robot made with two MandleBot Robot Arms and a more advanced head, like the one we made for Sentinel. Qibõ has a built-in temperature sensor to monitor heat produced by the motors. Qibõ can also speak using twin stereo speakers located on the top of its head. Qibõ is our talking robot made with two MandleBot Robot Arms and a much more advanced head, like the one we made for Sentinel. Qibõ has a built-in temperature sensor to monitor heat produced by the motors. Qibõ can also speak using two stereo speakers located on the top of its head. The 16 LED in the front of the head act like a mouth, with the LED turning on and off following the sound level of Qibõ’s voice. When in action, the head will look at and follow actions of the leading hand. To look more natural, when speaking a new phrase, the head lifts up, starts talking and looks around, then returns to looking at the leading hand. Both MandleBot Arms can move at the same time, so it looks very real. There are also two cameras located in the head. The robot then sends a 2-channel live feed to the software. The feed can be merged to create an Anaglyph 3D video which can be viewed through 3D glasses with red/cyan lenses. Qibõ features have been integrated into our Robotic Studio software. 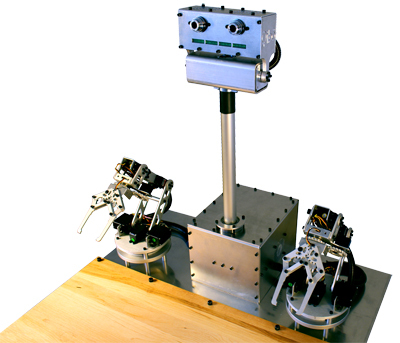 The head is managed completely automatically by Robotic Studio and needs no configuration at all. This robot was made for a special custom order. Both MandleBot Arms are bolted to a 20 x 14-inch aluminium plate. Qibõ also comes with three fans, two in the main unit and one in the neck. The gears that move the head are made in aluminium and plastic to keep the noise level to a minimum and not interfere with the voice. The neck is held in place on the body by two strong, 2-inch wide ball bearings. It makes the neck very solid and allows everything to move smoothly. Qibõ can be used for many things like live product presentations, movie and TV props, education, advertising and much more that we haven’t thought of yet! The claws of the MandleBot can be customized as per any special requirements. In this version, the claws were made to hold a special plastic cup.